Her Majesty Queen Elizabeth II, in the first of her annual Christmas Speeches (1952), reminded us that “Peace on earth, Goodwill toward men” is the eternal message of Christmas and the desire of us all. The Queen’s Christmas Messages describe the significance of Christmas as well as giving us her compassionate review of the year. 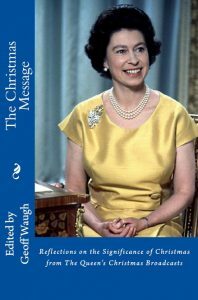 This book compiles in one volume her Majesty’s reflections on the significance of Christmas throughout the 65 years of her reign. The Queen's comments on the meaning and significance of Christmas have inspired me, so I compiled this edited version of excerpts from her annual Christmas Broadcasts.